I have tried Philosophy’s Full of Promise Treatment Duo in its separate parts, not in tandem, as recommended. I can this way describe what each one does on its own. Using both sera in a day will likely speed up the process of skin rejuvenation. Volumizing Nights serum has an interesting texture: it seemed oily, yet applied on the skin dry, almost like a film. It felt weightless. It’s effect was similar to Murad Advanced Active Radiance Serum, but without the glow induced by the latter and with less smoothing of the skin. Uplifting Days serum has a more traditional serum texture. Other than that, I did not notice any difference with Uplifting Days compared to the use of Volumizing Nights. On my skin, they worked very similarly. Although Philosophy’s sera duo is good, Murad’s Advanced Active Radiance Serum is better overall. For the same price and volume, Murad’s product is the clear winner. Sephora labelled Uplifting Days serum as “Morning Treatment Cream” and Volumizing Nights serum as “Night Treatment Cream”. Please keep in mind that these are not creams, but sera – they require moisturizer on top, especially for dry skin. Philosophy generally makes good products. They may not be on par with Shiseido’s luxurious inventions, but they have high quality bodycare for not as high a price. Full of Promise Restoring Cream is said to firm. It also says to uplift and volumize, but I’ve never seen these terms used to describe skin benefits. When I read this, I imagined puffy cheeks, like that of a child or, worse, a bee bite. There’s nothing to worry about of that sort with the Restoring Cream – it doesn’t puff up. It firms like it says it does. I am unhappy with its lack of moisturization, however. Despite the cream being relatively thick, my cheeks are feeling dry, although this can be due to one of longest and harshest winters we (Canada) have had in many years. I’ve never had to suffer dry skin for so long as I did this season, nor did it take so long for it to recover. 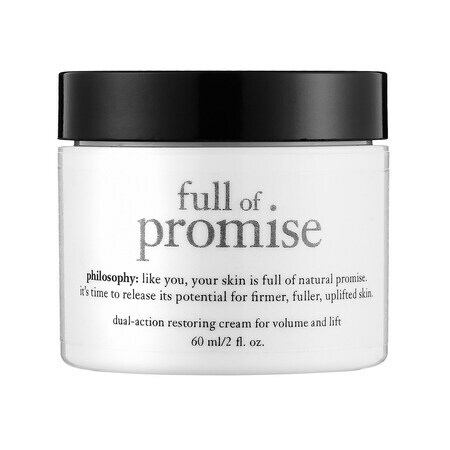 I am practically certain that Full of Promise Restoring Cream would have performed as a better hydrator in a different season, but it doesn’t claim to be a dry skin drink. Its actual claims are a little hard to understand, other than it is firming. Aging skin should give this cream a try. May be too thick for younger audiences. 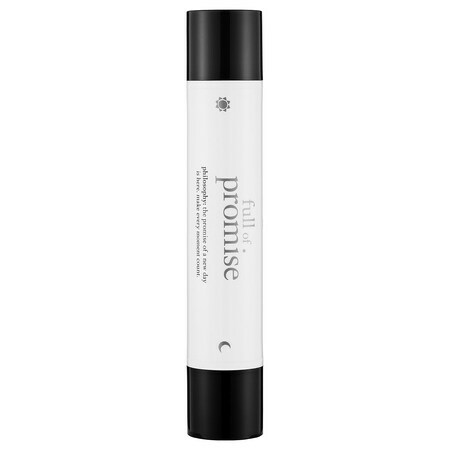 Philosophy Full of Promise Dual-Action Restoring Cream: 60ml for C$82.00 @ Sephora.ca.